Toilets for residential properties available in different sizes and certain type of a toilet will have its own measurements depending on a style and design. But, even though, with all variations in configuration there is not a huge difference in height, depth and width among the same type of toilets. Total height of one piece gravity toilet might vary from 21 to 30 3/4 inches (53 – 78 centimeters) with 14” – 16” (356 – 406 mm.) distance from the floor to bowl rim. Depth usually stays within 27” – 30” (686 – 762 mm) and width very rarely exceed 20 in (508 mm). 27 1/2”D x 18 3/4”W x 26”H (699 mm x 476 mm x 660 mm) ± 1” (25mm) are typical measurements of one piece of toilet. Two pieces with separate bowl and water tanks assemble into one unit cannot be as low as one piece toilets and overall height typically 26” – 32” (660 – 813 mm). But width and depth of two pieces of toilet similar to toilets which comes as a one solid piece. Tankless wall or floor mounted toilets do not have a tank for storing the water used for flushing. Actual bowl can be as low as 13” (330mm) and as high as 19” (483mm). But even if the bow is low it will be mounted on a standard height (14” – 17”) from the floor to rim with open space underneath. Floor mounted toilets will be minimum 14” and maximum 17” high. 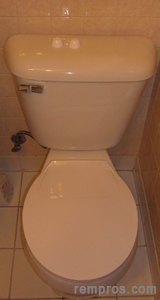 Tankless toilets are usually 14” – 18” wide and 20” – 26” deep. Actual measurements are not a factor of toilet cost determination. Smaller high quality and performance toilet might be much more expensive in comparison with a bigger but mediocre one on a budget option. Two pieces toilets for 12” rough in plumbing available in a broad range of cheap choices and might be a good solution on a low budget. Toilets rated on a scale from 1 to 10 by its flush performance. For the best results toilets with a higher flushing performance which rated from 8 to 10 on the scale might be worth to consider. Distance between finished wall and center of a floor drain or rough – in might be 10”, 12” or 14” depending on toilet type. But most residential floor mount toilets require one foot (305 mm) drain placement from the back wall. Minimum 15” space should be left between the center of a drain and finished side wall. Rough in for wall mount toilets with a back outlet will be determined by manufacturer and might vary from 7.5 to 11 inches (190 – 279 mm) depending on a toilet style. Most of toilets use 1.6 gallons (6 liters) of water per flush. But some, known as high efficiency toilets (HET) use as little as 0.8 – 1.28 gallons (3 – 4.8 liters) of water per flash. While replacing the only toilet it might be better to get the type which won’t require redoing drains, installing special pipes or any additional electrical work for power and pressure assist mechanism. But while it is a complete bathroom renovation project or on a new construction it might be a good solution to get the latest high efficiency power or pressure assist toilet with the best flush performance.